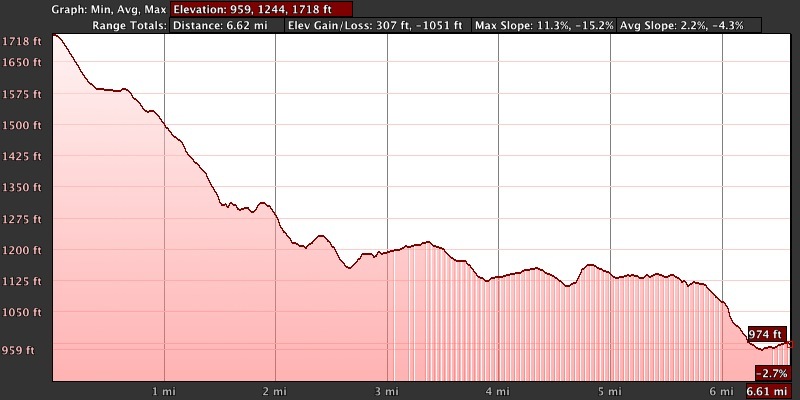 It was the elevation profile for Run for the Red Poconos Marathon. I stared lustfully at long sustained net decline all the way to the finish line. It was in the Poconos, close to NYC. It was in May. I could conceivably do marathon training over the winter and early spring. I couldn’t resist, I knew I had to do this race. I showed the profile to Ben, who immediately agreed that we should do this when he heard that it was in the Poconos. We were gonna do this. We were going to do a spring marathon. Flashforward a few months later, I’m wheezing and hacking away with bronchitis (yes, I still have it, but now it’s mostly gone. Mostly.) and I realize there’s no way I can do marathon training while ill. Luckily for me, the race director decided this year for the first time to do a half, so I register for the half instead. Ben and our friend, Delancey from the Jersey City running club, go ahead and register for the marathon. Feb, March, April, I slowly recover and train. I’m not sure if you can call the running that Ben and Delancey did as training. If you’ve been following me for a while, you know that last year Ben ran a 3:46 marathon with no training, so I wasn’t concerned about his ability to pull this off again. Delancey is an old codger who’s been running for decades, so I figured he’d do whatever he’d do. We picked up our bibs at the expo on Saturday and then went to the race pasta dinner. The dinner ticket was $8, but they had a sale for buy one get one free, so dinner was only $4 each. You get what you pay for. The spaghetti and meatballs were nothing to speak of, but the money was going to charity. My recommendation is that you skip the race pasta dinner. We rented a lovely home in Pocono Summit that was 1.6 miles from the start line. It was great because, despite the early start time of 7 am (last year they had a brutal heat wave and started at 8 am), we had a relaxing easy morning. We left the house at 6:30 and had plenty of time to park and use the facilities at the local high school where the start line was. All the runners start at Pocono Summit. The half marathoners stop after 13.1 miles, while the marathoners continue to the other high school in Stroudsburg. Most of the runners were marathoners. I found the 3:40 marathon (8:24) pace group that was led by Otto. When I was excited that Otto was pacing because we were Headsweats ambassadors together last year and he was supposed to do my pace group for Wineglass last year, but he opted to do another race instead, so I didn’t get a chance to meet him. He remembered me from Wineglass because we had “talked” on Facebook before the race. Otto is a great pacer with tons of experience. If you ever get a chance to run with him, I highly recommend that you do so. He chatted to us about the course profile and general race strategy. He said that we shouldn’t get tempted by the downhills and go too fast because it was like pressing the gas pedal when going downhill. He said we wanted to coast and save our energy for when we need it going uphill and at the end. Then he asked each of us what our plans for the race were. A few people were attempting to BQ. 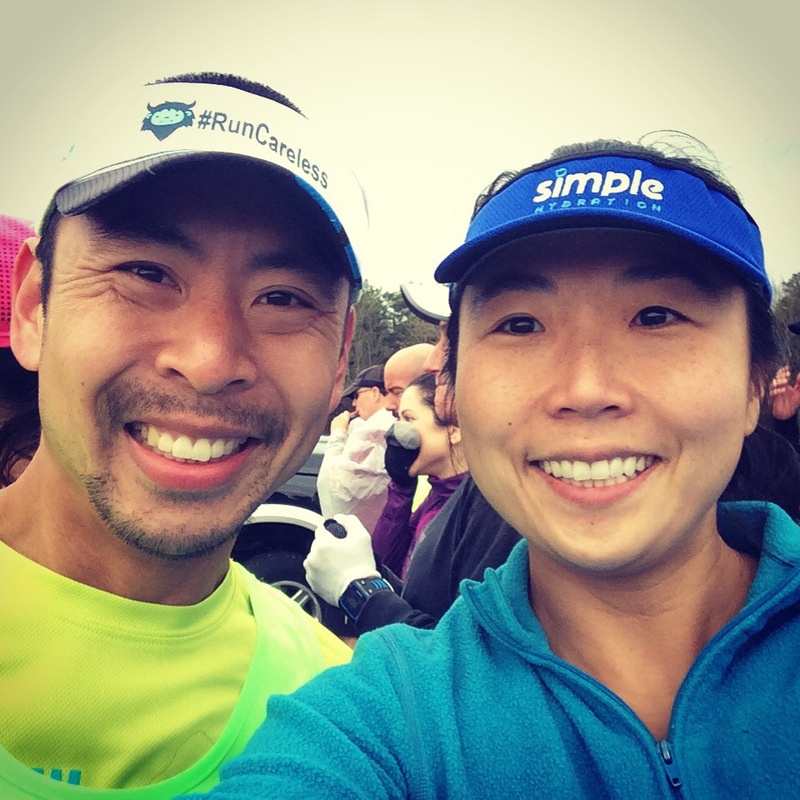 When it was my turn, I gave my favorite answer to pace leaders about my own personal plans, “I’ll start off with you for the first few miles and then I’ll slowly pull ahead. If all goes well, I’ll never see you again.” Otto and the other runners laughed. Otto said, “Wait for us at the finish line.” I told him that I was only doing the half, so I would wave to him and others as they go by. The weather was absolutely great for me. I like it cool and overcast. We had been worried about the high winds that the weather report predicted, but luckily for us, the strong winds wouldn’t pick up until the afternoon. It was also coming from the west, which meant that for a majority of the half, I would have a tailwind. It was so cool that the Gatorade in my Simple Hydration bottle never fully melted. This wasn’t a problem during the race because I wasn’t sweating a lot so I didn’t need to drink as much as I normally do. I wasn’t really sure what was going to happen. On a great day, anything can happen, like at Trenton, where I pulled off a 1:46:36 despite not training for that pace at all. On a good day, I thought I could get my second fastest half. Otherwise, a 1:50 was a perfectly good time. Because I race so often, after three miles I have a good sense of how the race is going, how I’m feeling, and what pace I should be hitting. Unfortunately for 5Ks, the race is pretty much over by then, but for longer races, there’s enough distance left to shift plans into higher or lower gear. If I was feeling great, I thought I would stay with Otto for the first mile and then pull away. If I felt like it was a struggle, then I was going to wait until Mile 5 before I made my move. 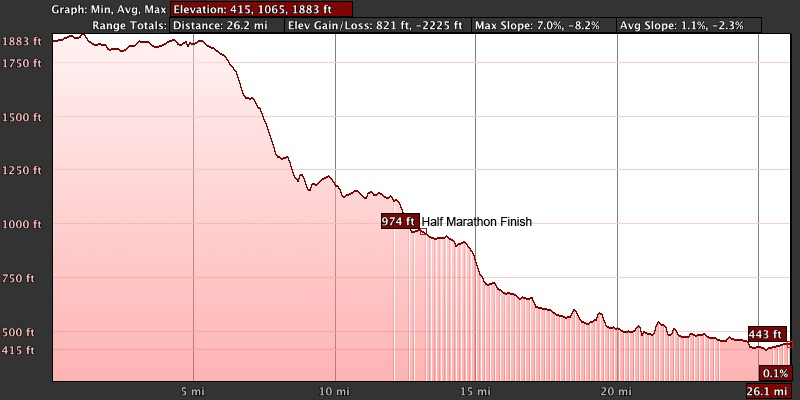 Above is the elevation profile for the first half of the half marathon (or the first quarter of the marathon). Because it’s in close detail, the inclines look scarier than they actually are. There are a ton of rolling hills, but they’re all minor and barely noticeable. By the time you notice that you’re going up an incline, you’re at the top and going down on the other side. The first five and a third miles are pretty flat. The killer descents start just after Mile 5. Mile 1 (23 ft): 8:22 Good thing I started with Otto because I wanted to fly out! Pacing with him kept me from going too fast. There’s a slight headwind, but it’s nothing. I know between Mile 2 and 3, the course will turn and it’ll be a slight tailwind from there on out. Mile 2 (-52 ft): 8:07 I’m working a little harder than I would like. It’s not going to be a great day, I can tell, but could still be a good day. Mile 3 (30 ft): 8:29 Warming up nicely. I feel a teeny tiny side stitch, but nothing that I can’t handle with breathing. Take a few deep breaths and it goes away. I’m settling in and getting to work. Mile 4 (-8 ft): 8:13 I think about breaking away. I tentatively push the pace a bit to see how it feels. If it felt like work, then I was going to immediately slow down and continue with Otto. I push. The faster pace feels fine. The effort feels the same as the slower pace. I decide to go with it. Mile 5 (2 ft): 8:23 I’m already salivating over the anticipated steep drop off that’s about to happen. Mile 6 (-56 ft): 8:04 I sigh at this relief. I feel good and relaxed. There’s a slight headwind here too, but the decline more than makes up for it. Nothing can slow me down. Mile 8 (-272 ft): 7:37 I’m loving this! Now it might look like that I was pressing on the gas pedal, but it was anything but. I immediately could tell when the gradient became steeper decline because despite the fact that Garmin was cheerfully showing me 7:3X, my heart rate was the slowest it had been all race long. It felt like a walk in the park. In order to capture as much of the help from the decline, I focused on my running form. I normally run with short choppy strides, but in order to take advantage of the decline, I lengthened my stride (without overstriding) and concentrated on getting as much air time as I could. This was my favorite mile. I thought that if the rest of the race had this steep of a decline (it didn’t) I could easily cruise this speed all the way to the finish line without breaking a sweat. Mile 9 (-123 ft): 8:08 Still a lot of lost elevation, but I’m noticing that it’s not as much as the prior mile. I’m hoping this party won’t end soon. Mile 10 (-4 ft): 8:35 Oof. The party ended. Not enjoying this. Mile 11 (-52 ft): 8:27 Maybe the party is picking up again? I’m hopeful. Mile 12 (-1 ft): 8:56 No, no, no. The party is definitely over. The police came. Everyone has to go home. The decline is definitely completely over. The small gradual incline, after the miles of steep declines, looks deceptively steep. I’m convinced that I’m running up Mt. Everest, so I don’t feel bad when I see how much I’ve slowed on my Garmin. 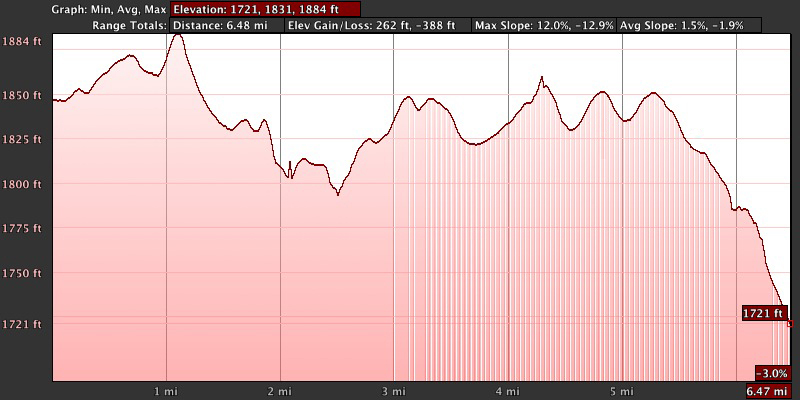 I’m positive that the elevation profile would justify the slowing. Much to my chagrin, after the race, I find that this was all in the my head and the road was essentially flat. It’s hard running on flat after all the declines. Mile 13 (-154) 8:11 Hey, look, there’s another party, but it’s late now. I’m tired. I’m ready to head home. Mile .1: 7:14 I SEE THE FINISH LINE!!!!!!!!!!!!!!!!!!!!!!!! I hear Ben cheer for me. He’s wrapped up in a silvery heat blanket. I cross the finish line in 1:48:02. Super big smiles from me. It’s my second fastest half. I was right. It was a good day. I get my medal and desperately get a heat blanket around me. Although I was warm enough while running, I quickly got cold. I hobbled over to Ben and got some food. We sat on the grass while I recuperated. 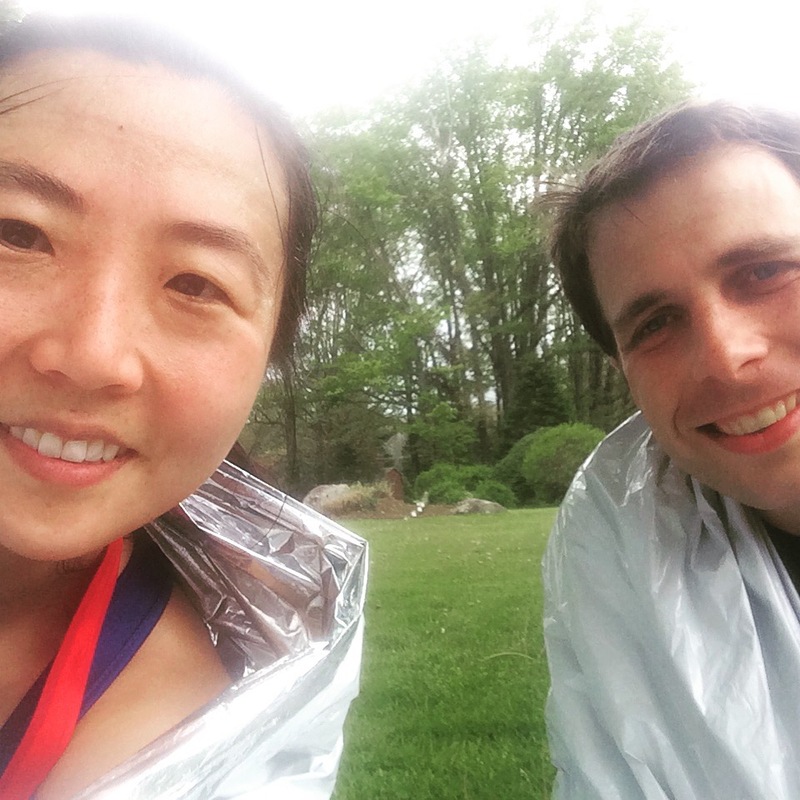 Ben told me about his race experience; how he felt fine until about Mile 9. At that point he felt pretty terrible and decided to stop at the halfway mark and wait for me. I munched on some food and we wondered how Delancey was doing. In the morning he said that if he were having a good day, he’d do a 5-hr marathon. Well, if that were true, then he would be crossing the halfway point just after the clock turned 2:30 (he started near the back). It was getting chilly. Ben shepherded me to the glass lobby of a cute bed and breakfast that was right there. We sat on a bench in a warm area with the perfect view of the course. Minutes ticked by. We debated whether we should encourage Delancey to DNF. It was getting colder. The wind was picking up. It even rained for 15 minutes. Delancey was underdressed for the weather. “You’re just rationalizing your behavior,” Ben said. “What else is new?” he asked. More minutes ticked by. Ben sighed and assessed that Delancey was on his way to a 6-hour marathon at best. A shuttle bus appeared. We had hoped that Delancey would appear so that all three us could ride together, but since we had no idea when he would show up, Ben and I decided to get on the bus. I had given Delancey the info that he decided to DNF, there would be a shuttle bus that would take him back to the start line and I could pick him up at the school. We shuffled to the bus and found seats. The bus waited for some more minutes for other runners who were coming in from the finish line. Ben and I debated some more about whether we should text Delancey to let him know we were in a bus. The entire bus heard us and knew we wanted our friend to quit. Finally, I saw Delancey shuffling by. I stood up, point, and yell on top of my lungs, “There he is!!!! !” Ben and I craned our necks to see what Delancey would do. If he ran on the left hand side of the road that meant that he was going to quit. If he ran on the right hand side of the road, he was going to continue on marathoning. I pump my fists in the air. I see Delancey running. Running. AND THEN HE STOPPED!!!! HE’S WALKING!!!!!! Ben and I jump for joy. I frantically text him that we’re on the bus and we’re waiting for him. The bus driver kindly waits. Some hours later, when we’re in the AirBnB house, showered, eating food, and relaxing before the long drive back home, we told him the story of our wishing that he would DNF, how we would encourage it, and then what happened in the bus before he came. He roared with laughter and loved the story. Then he said that he didn’t need any encouragement to stop at the halfway point because he had already decided to do so at Mile 1. I enjoyed this race and would be happy to do it again. It’s a very small race; the field was fewer than 2000 with the marathoner and half marathoners. There isn’t much crowd support because we’re running through rural areas. This doesn’t bother me, but I know crowd support is important for some runners. If you need crowd support, then go look elsewhere. The scenery is nice with all the wonderful trees and forests. If you like small local races in rural areas and steep declines (with rolling hills), you’ll love this race. Thanks for the memories, Poconos! I love this review. The inn that you guys sat in was where we stayed. We had a fun time there and I highly recommend if you want a quick getaway. That course was fast at times and you did have to just roll with it. Otto sounds like a blast! Congrats on a great finish. What a cute inn! Thanks for the congrats. While running on the steep descent, I was so sure I was going to catch up with the earlier pace group, but they kept chugging along. It was a good trial run before Steamtown this fall. Ben and I are already planning on going back to the Poconos so I can do more hill/downhill training over the summer. LOL, this is one of my favorite recaps of yours!! Had me giggling the whole way. Great run, girl!!! Thanks! It was fun to write. Sometimes they just write themselves, ya know. Oooh, I love new commenters! Thank you so much for reading. I’ve never been to Austin but I hope to visit one day. What an interesting half! That continuous decline looks like no joke. It’s the longest steepest descent that I’ve experienced running! Great review! Sounds like you guys had a blast and a pretty awesome run. Thanks. It was a sweeeet course. I love downhill races.